In this construction process, almost every day one of my main chores is putting all of this stuff inside Box Van in some kind of order. This repetitive almost daily quest for order may not seem like a mission-critical item. But it is! For example, there is a switch on a line from the house battery that has tiny Philips head screws in the wire clamps. I have 2-sets of jeweler's tools which could easily handle these tiny screws. If these jeweler's tools could be found! So, I am constantly going thru all of this stuff to make decisions where things may be stored. And easily found. One decision that really clears things up immensely, is the decision to discard something. After moving into Box Van, I really needed my card-table. I worked from that card table for many hours each day. But since commencing my living quarters construction, the card table has been taking up space leaning against the tall cabinet. I will go to Goodwill today to find out if this table will be accepted. I am at Home Depot again. 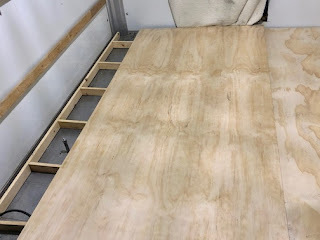 This time to purchase the plywood top for the raised floor. I figured to buy plywood boards that had a rough finish. But the rough finish plywood boards were curved a great deal. Also, the rough finish plywood costs a lot more than the good-looking plywood! So, I bought the good-looking inexpensive plywood boards! Really cool to hear you are coming along splendid with the build-out. Fun to follow along! This afternoon, I completed the entire raised floor! I have not Blogged about that yet. So, this is an advance news comment! Happy Birthday George, I hope you are having a wonderful day! It was a wonderful working day for me! I love this kind of day! Any day where I get to work with my hands on a project or repairing something is my meat! Though I do love a good card table, might you need it later? BIRTHDAY?! And what a birthday it is! I sure hope you bought T&G 3/4' plywood. Are you advising pressure treated plywood for the interior of my living quarters? Nope...not pressure treated. Never use pressure treated in living spaces unless it is for stud wall floor plates with direct concrete contact. Just 3/4" T&G. With 16 inch spacing of the underfloor members, your floor will probably be "spongy" if using anything less than 3/4", and tongue and groove (T&G) plywood is commonly used in residential construction to eliminate movement between sheets of plywood. You can probably use thinner plywood with success if you are building a laminated construction floor and do so properly. With 12" spacing of the underfloor structure, 5/8' plywood would probably be sufficient. Good luck. There are 2-pieces of NON-tongue and groove plywood used in my living quarters raised floor. These 2-pieces are secured to the raised floor framing by the use of 3M VHB RP25 Tape Strips. T&G is overkill. Glue the 1x's flat on the aluminum floor using construction adhesive. If you use 3/4 rigid foam insulation board, you can get away with 1/4" plywood glued to the sleepers and the foam surface (assuming aluminized foam board). George, Do it your way (I feel certain you will, after all). I was just trying to help you avoid less than ideal results. I have built many houses and thought my experience would help. It seems evident that you have made up your mind to use construction methods that do not conform to standard building practices. Good luck. Please give the 3M Very Heavy Bonding Tape a try. You may become a fan! I've used the 3M VHB tape for several projects, such as attaching trim to motor vehicles, mounting a bathroom mirror, etc. But I've never used it for a construction project...I prefer mechanical fasteners (nails/screws) and construction adhesive for things like floor decks...less movement, fewer squeeks. YMMV. Good Luck. I am also glad to be out there! Now I am past my 81st birthday and still have my pedal to the metal!